Stem cells are important in the maintenance and repair of many tissues all along the life span. It is the case in skeletal muscle, which presents high plasticity and regenerative properties to keep constant physiological parameters (homeostasis). Normal skeletal muscle mobilizes tissue-associated endogenous stem cells, mainly satellite cells, to repair damaged myofibers. Indeed, muscle stem cells sustain regeneration that is crucial for muscle homeostasis, as well as the self-renewal mechanisms that maintain their pool constant. A key issue we address is the tissue environment in which muscle stem cells are activated. Environment plays important roles in the behavior of muscle stem cells and myogenic cells, although the mechanisms are poorly unknown. 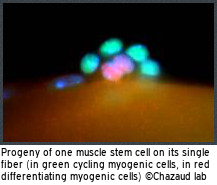 Various cell types in the vicinity of stem cells communicate with each other to correctly drive regeneration. We explore the roles of immune cells (inflammation), endothelial and peri-endothelial cells (angiogenesis) and interstitial cells (fibrosis) on myogenic cell fate in normal healthy regenerating muscle and during muscular dystrophies. Indeed, myopathies are characterized by the alteration in the environment of muscle stem cells, such as the presence of chronic inflammation and fibrosis, which are detrimental for both tissue repair and cell therapies. Skeletal muscle regeneration is associated with the presence of macrophages. Two main inflammatory types of macrophages are present during skeletal muscle regeneration. Soon after injury, inflammatory monocytes enter into the damaged muscle and these inflammatory macrophages stimulate the proliferation of muscle stem cells. Later, they switch their phenotype into anti-inflammatory macrophages that sustain myogenic differentiation and myofiber growth. Macrophages can be considered as a stromal support for myogenic cells that helps the sequential steps of skeletal muscle regeneration. Our research focuses on the molecular mechanisms that regulate the inflammatory status and functions of macrophages during this process. 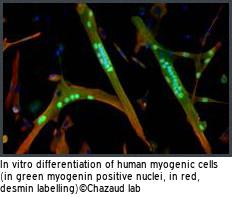 We also study macrophage functions during myopathies, where they are associated with fibrosis. We also investigate the interactions between muscle stem cells and vessel cells, since satellite cells are located close to capillaries in normal muscle. 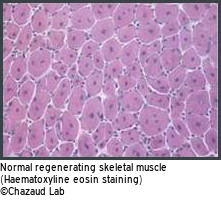 Endothelial cells and myogenic precursor cells interact to stimulate each other growth and differentiation. On the contrary peri-endothelial cells (smooth muscle cells) promote the self-renewal and maintain into quiescence of myogenic cells. 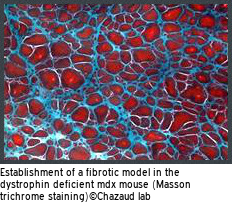 We aim at understanding the molecular regulation of the coupling between angiogenesis and myogenesis during skeletal muscle regeneration, as well as identifying whether these interactions are altered – and how – in various myopathies. Mechanisms controlling muscle stem cell fate are not fully known and account for both autonomous and non-autonomous regulations. Our research highlighted intracellular crosstalk between metabolism and inflammation during muscle regeneration. Identifying whether metabolism regulates muscle stem cell fate in a cell autonomous and a non-autonomous way is of importance in the understanding of muscle homeostasis. In this context, we decipher the role of metabolism on muscle stem cells by investigating metabolic regulations of their fate, particularly the role of AMPK and the metabolic characteristics of muscle stem cells. The goal of our program is to determine the dynamic interactions between metabolism and muscle stem cell fate during muscle plasticity and return to homeostasis. Cachexia is a common consequence of many chronic diseases including sepsis and cancer. This loss of skeletal muscle mass ultimately results in increased morbidity and mortality. Moreover, treatments, sedation and/or prolonged unloading may further increase muscle deconditioning. On that basis, the development of countermeasures to prevent or attenuate the loss of skeletal muscle mass is of utmost importance for both patients. Our aim is to investigate whether and to what extent NeuroMuscular Electrical Stimulation (NMES) is a promising therapy for increasing force production and promoting muscle growth in preclinical models of cachexia. The program aims at establishing rigorous protocols to exploit the benefit of NMES on muscle function and at identifying the cellular and molecular events underlying those beneficial effects. Our goal is to identify new functions for the cell neighbors of muscle stem cells beside their canonical properties (regulation of inflammation for macrophages, supply of oxygen and nutriments for vessel cells) and how muscle stem cells are controlled by their closest environment in both normal and pathological contexts. The identification of new molecules or novel functions of already known pathways are the basis for expanding our current understanding about skeletal muscle plasticity and its pathophysiology.